→Who Pays if the Other Driver Has No Insurance? According to the most recent statistics, there are more than 8 million licensed drivers in the state of Illinois. Although drivers must show proof of insurance in order to register their car, they can cancel the insurance shortly after that. As a result, more than 13 percent of Illinois drivers are uninsured. moderately severe injuries. The mandatory liability insurance law requires drivers to have coverage of just $25,000 per person and $50,000 per accident. If you were severely injured, that amount is woefully inadequate. An overnight hospital stay can cost tens of thousands of dollars. One unfortunate statistic is that drivers without insurance seem to be more accident prone than those with insurance. Uninsured motorists are 72 percent more likely to be in an accident than those who are insured. The primary means that uninsured drivers are discovered is when they are stopped for a moving violation. If they do not have proof of insurance, they may be fined up to $1,000 and have their registration and driver’s license suspended. Illinois is attempting to enforce the insurance requirement by sending out approximately 300,000 random audit letters every year requiring people to show proof of insurance. If they fail to do so, their registration and driving privileges can be suspended. Not all accidents involving uninsured motorists are covered. If another vehicle cuts in front of you, causing you to run off the road and have an accident, like hit a tree, roll your car, or land in a ditch, for example, but the other car had no physical contact with your vehicle, there is no coverage. You are covered under following circumstances. You are hit by a hit-and-run driver. Another driver who did have physical contact with you car was at fault for the accident. You were hit while driving a car you don’t own or were traveling as a passenger in another vehicle and the driver at fault for the accident has no insurance. If you are hit while a pedestrian crossing the street and the accident was the fault of the vehicle driver. If you have been a responsible driver and kept up your own insurance, you will be insured under your own policy. 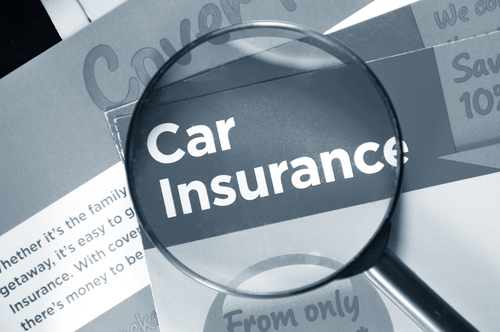 Illinois requires uninsured motorist coverage to be part of every auto insurance policy. The standard required amount of uninsured motorist coverage is the same as the minimum requirement for your liability coverage: $25,000 per injured person and $50,000 if more than one person is injured. If you do not want that much coverage, you have to sign a document that you voluntarily chose to reduce the amount of uninsured motorist coverage. I strongly suggest that you have as much liability and uninsured (and underinsured) motorist coverage as possible. Your minimum coverage should be no less that $100,000. It is a much better strategy to increase the amount of your coverage instead of decreasing it. Medical bills pile up quickly. If you are injured so severely you cannot work, money worries may haunt you since you will be unable to keep up with your regular bills. Although $25,000 might sound like a lot of money, when it is being used for paying hospital and medical bills, the money is exhausted fairly quickly. As with almost all insurance claims, Insurers can be difficult to deal with when it comes to collecting on your uninsured motorist claim. You must prove that the accident was the fault of the other driver in order for your coverage under your own policy to apply. Your own insurance company becomes your adversary when you file a claim, not your advocate. You need an advocate. You should take advantage of a free no obligation consultation with an insurance attorney who is familiar with the legal intricacies of proving who was at fault for the accident, proving what your damages are, and dealing with insurance companies for uninsured motorist claims. I authored the eBook, “Uninsured, Hit-and-Run, and Underinsured Motorist Coverage in Illinois” which you can download for free. We would be happy to help you with your underinsured or uninsured insurance claim. Let us fight for you to get the compensation you deserve. You can concentrate on recovering from your injuries while our law firm concentrates on obtaining the best possible settlement on your behalf. Contact us for a no obligation free consultation.